Here is sunny southern California we are having a really warm winter. Of course, we appreciate the warmth (I know some of you are very, very cold right now) but I would really love to have some rainy day fun. I’ve been stockpiling ideas for when we do get a little rain and have enjoyed looking back over some of the rain play we’ve done in the past. I can’t believe how little my M and M were back then, it just doesn’t seem like it was that long ago. Are you in enjoying some rain? We loved this rainy day experiment! This rainy day fun post originally appeared on March 3, 2011.
what you need: rain, something fabric, something metal, something plastic, something paper, something wood, something cardboard. We used cotton fabric, a metal bowl, a plastic toy, a paper towel, a stick, and cardboard. You can collect all of the objects yourself or have the kids help you pick them out. 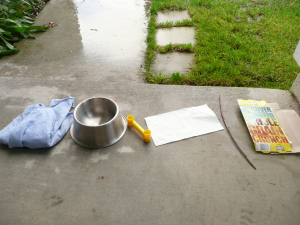 We talked about what the kids thought might happen to the objects when they sat in the rain. M and M put them in the rain. We waited. . .and yes all of Little M’s clothes are backward. That’s just how she likes it. The kids got a little wet, not too bad though! We talked about the objects. Did they look any different? Did the kids think the rain had affected the materials in any way? We touched, pulled and then discussed our findings. 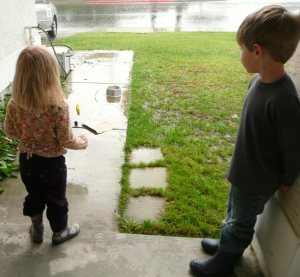 To expand on this rainy day activity, have the kids sit on the porch and write out their findings. Were their predictions correct on any off the materials? 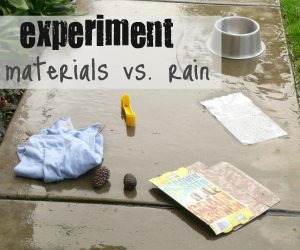 Did any of the materials react to the rain in the same way? Does the length of time in the rain change the outcome? What a great idea! 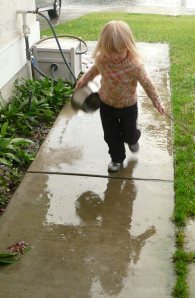 I will have to try it next time it rains. Come back and tell me how it goes! Hi ~ found you through No Time For Flashcards. This is a great idea. It is the simple things that our little ones learn the most from. I look forward to following your blog! Welcome! I agree it is the simple activities that are the best received. Maybe because they are so simple that Mom can be totally focused and not fussing over details! Thanks for the reminder that the very simple lessons are all it takes sometimes! It’s snowing here… but I’ll remember this one in the spring! Very cool idea! So simple but what a strong point to make. Here is another variation on this experiment. Take four pieces of paper, a crayon, a marker, a pencil, and a piece of chalk. Draw with crayon an the first paper, pencil on the second, a marker on the third and chalk on the fourth. Put the papers side by side outside in the rain. Watch what happens. Which pictures change and how? This is a great activity for budding scientists. I am adding it to my round up for the next Monday. Thanks for sharing with After School Link Up. YAY! Thanks so much Natalie! What an awesome way to take advantage of a dreary drizzly day! Thanks for sharing at the After School Linky Party!